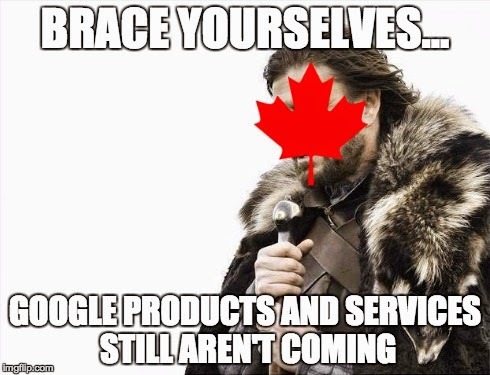 #GoogleHatesCanada Canada Google humour tumblr What are the things you wish Google didn't hate Canada for? What are the things you wish Google didn't hate Canada for? I don't know who started it... but I've been using the #GoogleHatesCanada hashtag for a long time now. Google Now command "what am I listening to"
There's probably a lot more.. those are just the few off the top of my head. I could just stroll through a +Google post and see how many times you'll see a comment by me or another Canadian where it's "What about Canada". What are the memes you would add, or services you're waiting for? Sound off in the comments. We should probably make some master list and flood Google HQ with our requests. Just started something pretty quickly here.